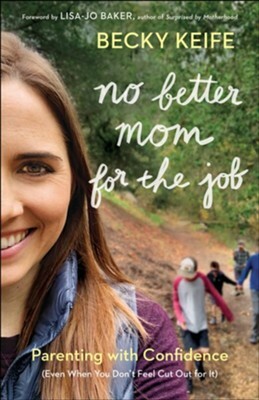 No Better Mom for the Job is for any mom who has ever felt inadequate--who loves her kids fiercely but sometimes thinks another mom would do a better job in her shoes. Becky Keife knows the ups and downs of motherhood. And she has learned along the way and from other mamas that it doesn't work to try to do more or be better. Confidence comes from leaning on the One who made you a mother. Filled with encouraging stories and practical, biblical wisdom, each chapter also includes one simple action step and a powerful prayer, all to help you see yourself as exactly the mom your child needs. Becky Keife is the community manager for (in)courage, a widely followed online community of Christian women. In addition to leading the many contributors to this ministry, Becky speaks regularly at MOPS (Mothers of Preschoolers) groups and other women's events. Becky and her husband live near Los Angeles, where they enjoy hiking sunny trails in the San Gabriel foothills with their three spirited sons, ages ten, nine, and seven. Learn more at www.beckykeife.com. I'm the author/artist and I want to review No Better Mom for the Job: Parenting with Confidence (Even When You Don't Feel Cut Out for It) - eBook.